Impact China, an acceleration program launched by Business France and Bpifrance, has selected OpenAirlines to help accelerate its growth in the Chinese market. A high-level jury of thirteen French-Chinese experts have chosen Openairlines and four other French companies based on predetermined criteria: mature startup with an offer in line with market expectations, dedicated teams to the project, product references and a solid business plan as well as an adequate financial resource to support their China development. Starting March 6, 2017, the program will allow OpenAirlines to accomplish in 3 months what would normally take more than a year. 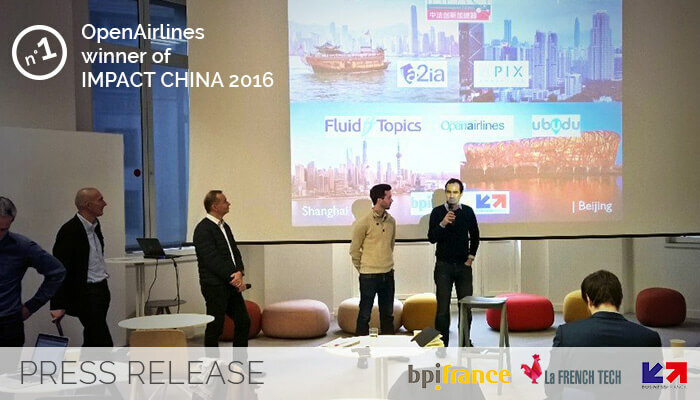 Leveraging its local network and know how, Business France and Bpifrance will support Openairlines navigate the Chinese business environment and practices and will expedite its visibility in the Chinese Airline Market. The personalized approach proposed by the program will help accelerate the deployment of its SkyBreathe® solution, a smart fuel saving and CO2 reduction software for the airlines. This solution is currently used every day by over 20 airlines on all continents and helps save millions of dollars and thousands of tons of CO2 every year. “China is a strategic market for us. This market is open and fast growing. In addition, the Chinese airlines are eager to use new technology to improve their operations, fuel efficiency and environmental impact. I’m very pleased to be part of this program and very eager for the opportunity to help Chinese airlines to reduce fuel, save money and safe the planet” Said Alexandre Feray, OpenAirlines CEO. In 2015, OpenAirlines raised 1M€ of private equity from Alter Equity, the leading French development fund specialized in responsible investment, to accelerate its international development with a special focus on Asia. At the end of 2015, OpenAirlines opened its Asian subsidiary in Hong Kong. Within the scope of the Impact China 2016 program, OpenAirlines plans to grow its brand at the airlines as well as at the Chinese CAC authority and to become their preferred Fuel efficiency solution.